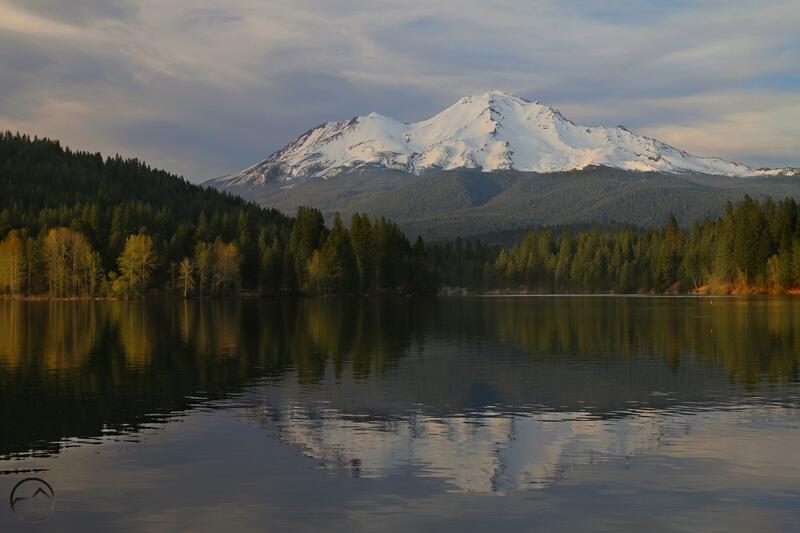 A classic west-side view of Mount Shasta from Lake Siskiyou. 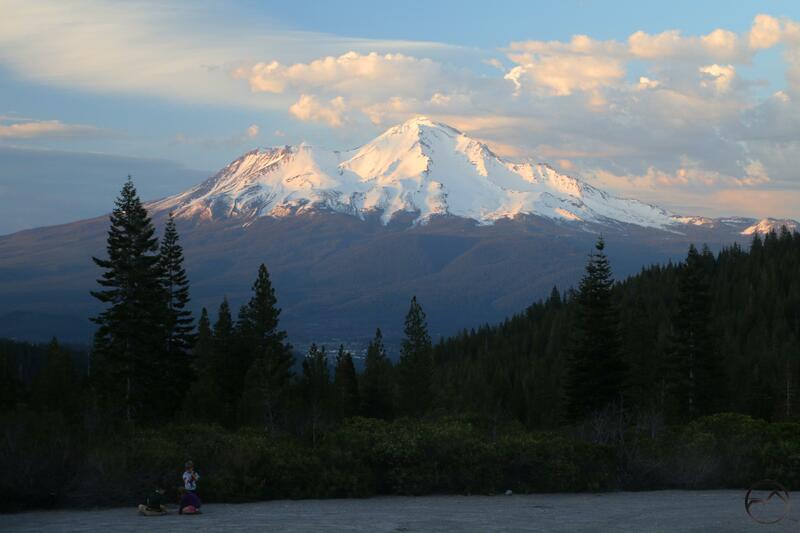 With its immense size and great height, Mount Shasta is almost a mountain range unto itself. 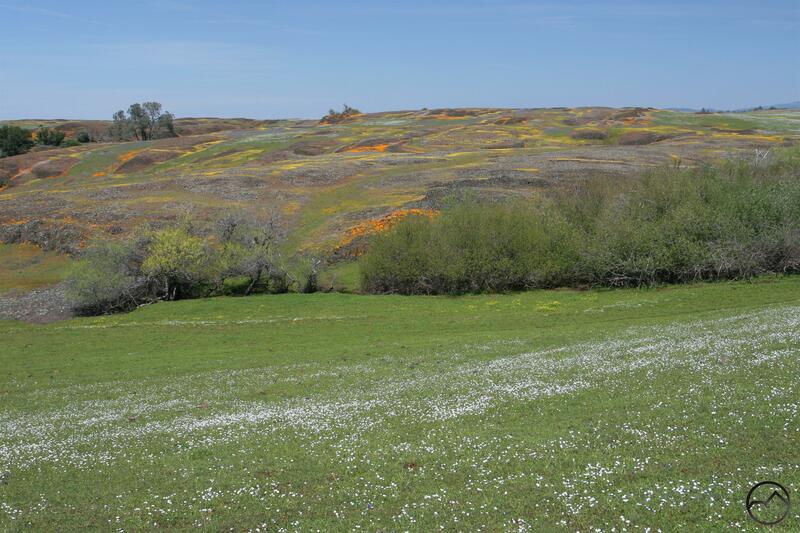 Consequently, it has a mountain range worth of landmarks to observe and recognize. 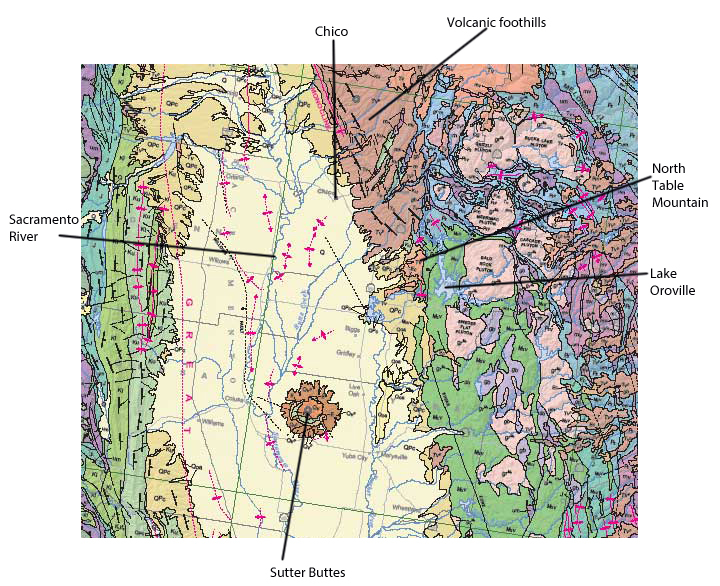 While some of the landmarks, such as Shastina and Shastarama Point are prominently visible and easy to distinguish, others are more subtle and don’t initially stand out without some sort of visual aid. 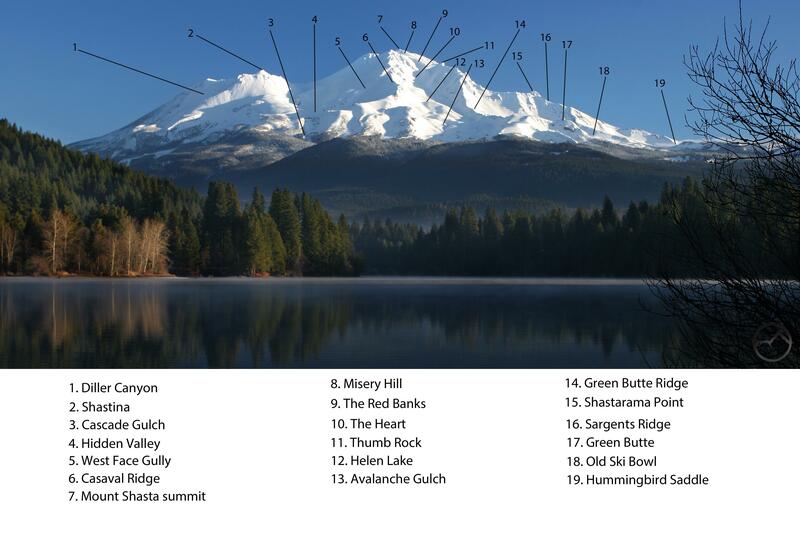 The purpose of the landmark locators is straight forward: to make it possible to learn and recognize the geography, prominent features and landscape of Mount Shasta. 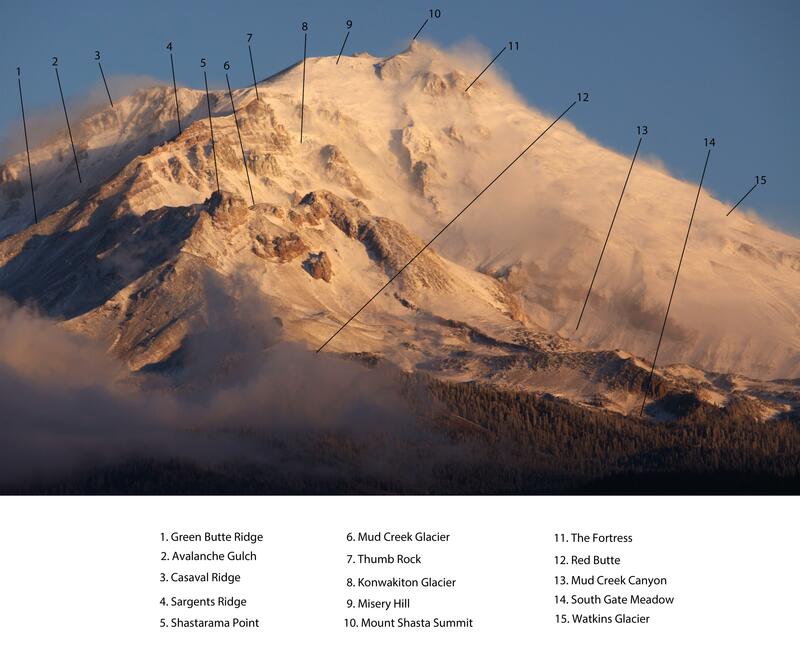 With these guides, it should be easy to distinguish what is where on the mountain. 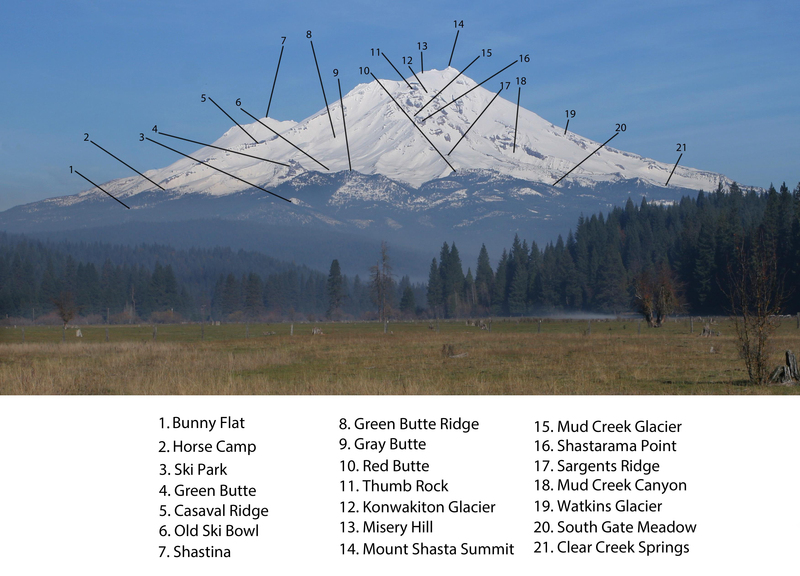 The lcators are broken up into for cardinal perspectives on Mount Shasta, with a couple of additional locators included to provide more detail when necessary. 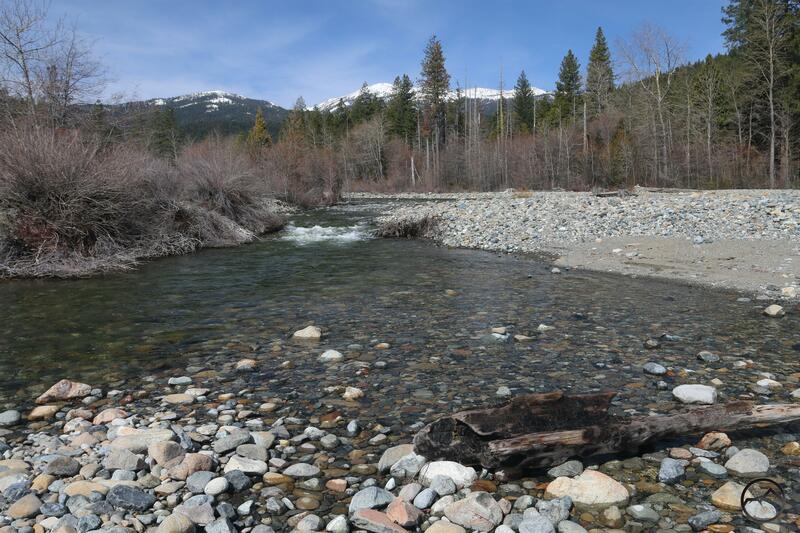 It is my hope that these tools will be useful for both visitors and longtime residents of the Mount Shasta area alike. 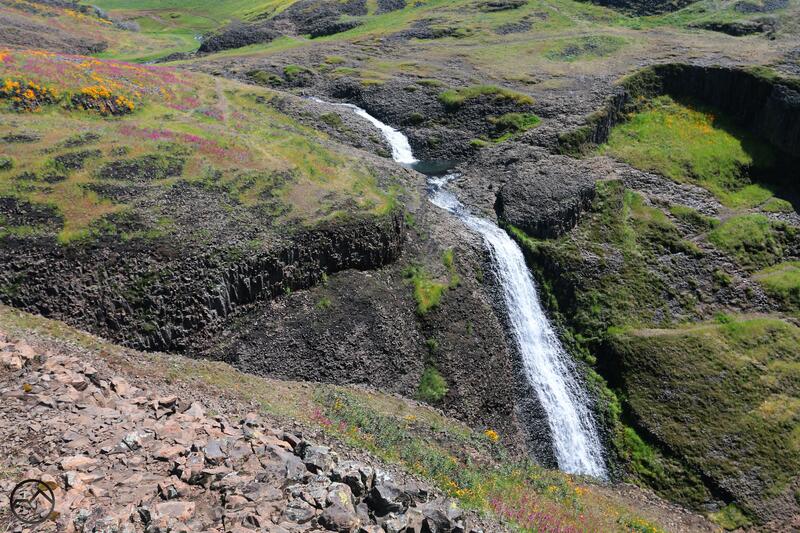 It is a magnificent mountain and it is good to have an understanding of its landscape. 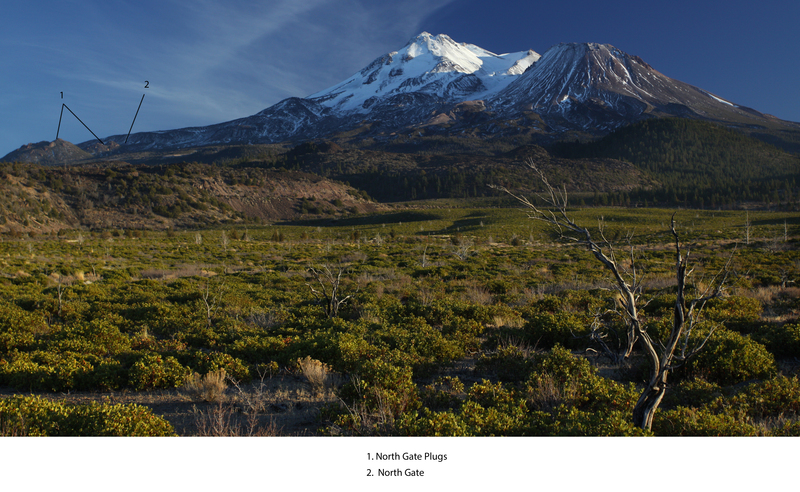 The western side of Mount Shasta is probably the most recognizable due to its position near Mount Shasta City. 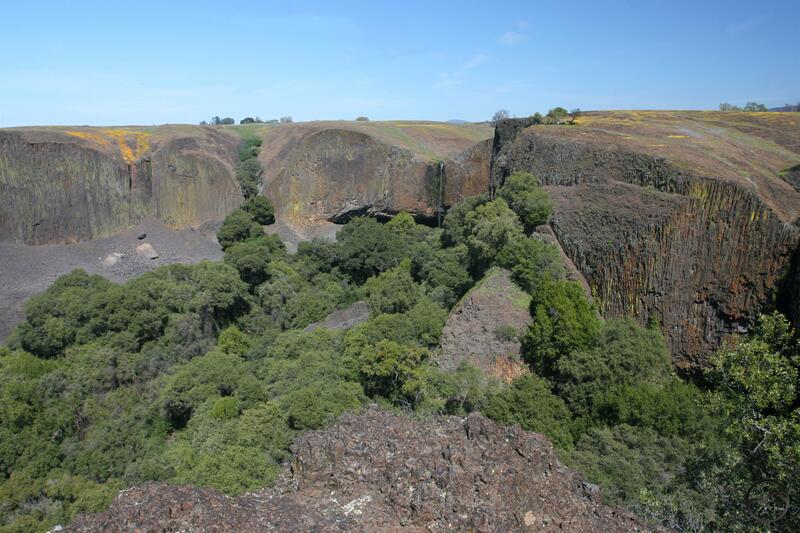 The presence of Shastina, and to a lesser extent, Shastarama Point, give the mountain a less conical shape and it appears to have over-sized shoulders. Nonetheless, this distinctive perspective is a spectacular sight above town, inspiring awe in all who visit. 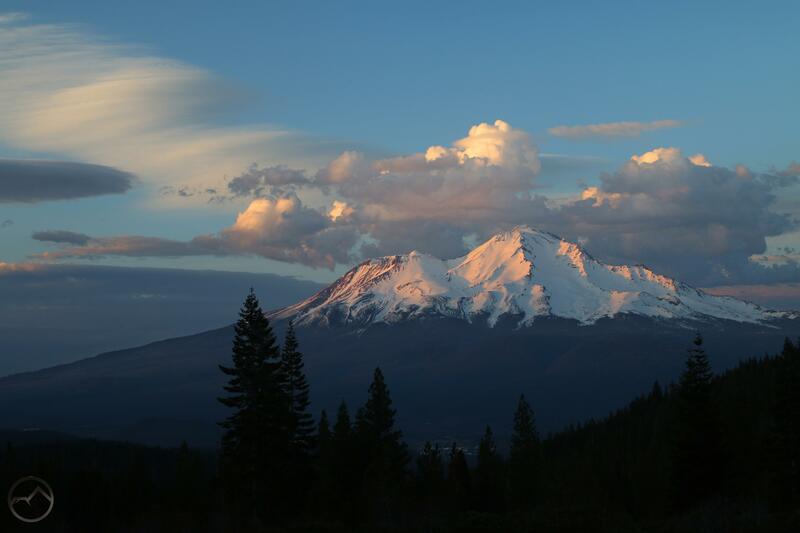 When seen from the Shasta Valley, the north side of Mount Shasta is one of the most visually distinct and pleasing perspectives. 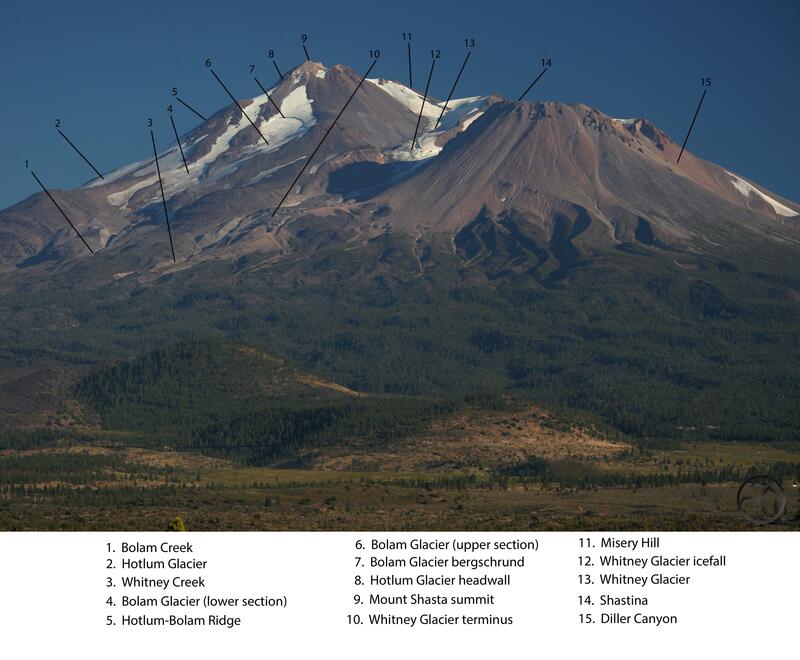 The balance between the main summit and Shastina is excellent and this side is graced by the presence of the Whitney and Bolam Glaciers, the 2nd and 4th largest glaciers in California. The south side of Mount Shasta stands shoulder to shoulder with the north side as the most pleasing perspective on the mountain. Shastina is less prominent from this angle and the main bulk of the mountain is more conical. Though the small Konwakiton Glacier is visible,it lacks the grand glaciers of the north side. 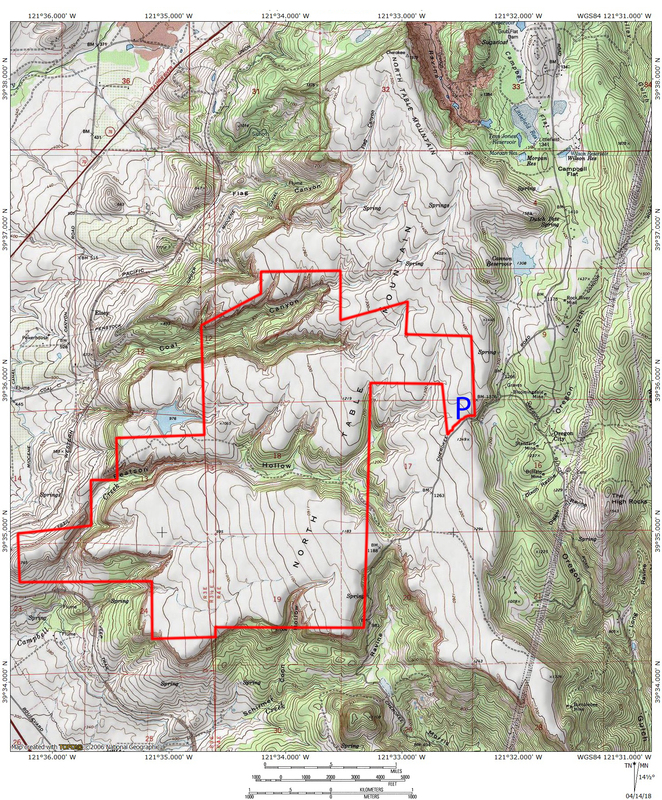 However, the presence of the Mud Creek basin, with all of its grand spires and the deep Mud Creek Canyon provide a spectacular visual focal point. 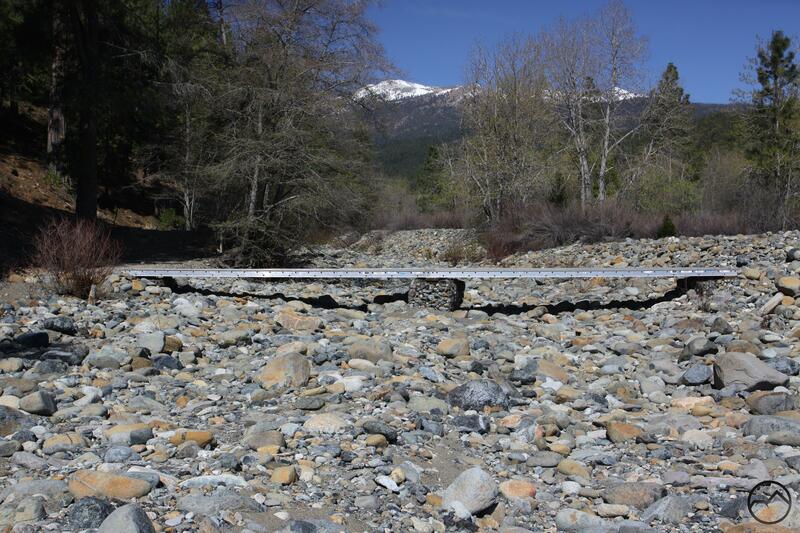 The enigmatic east side of Mount Shasta is by far the least viewed. With no settlements or major roads to the east, very few people venture into the area to appreciate this unique perspective on the mountain. Notably, this is the only side of Mount Shasta where Shastina is not visible. 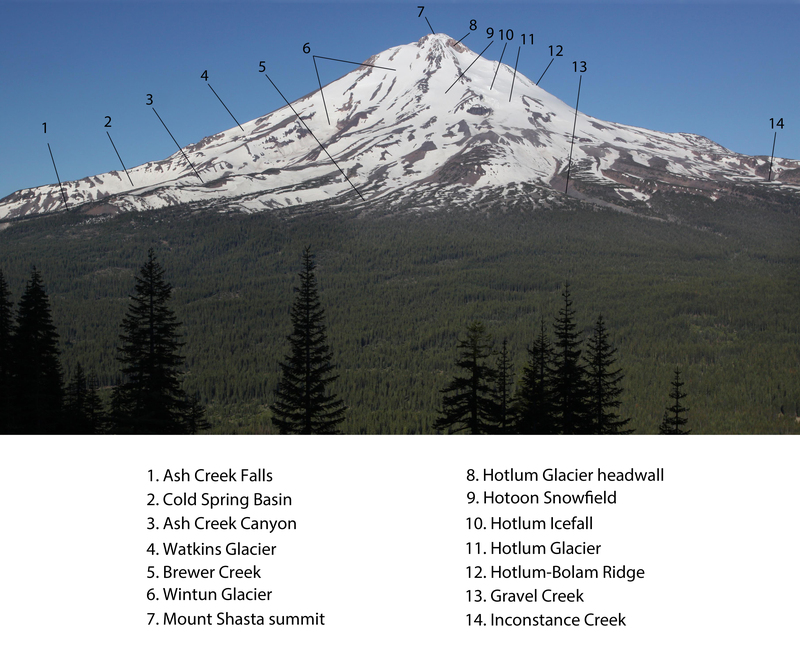 Consequently, the mountain takes on a more “normal” appearance for a Cascade volcano, with a single, massive conical form. 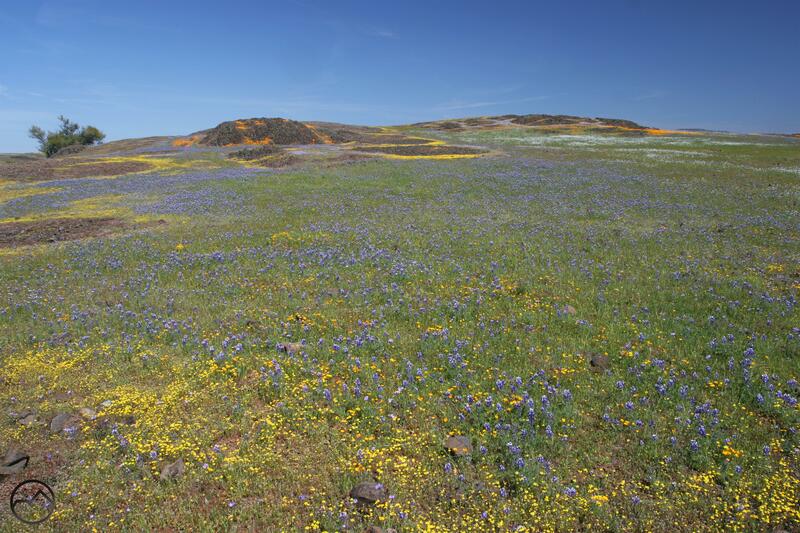 The east side is also notable for the presence of the Hotlum and Wintun Glaciers, the 1st and 3rd largest in California. 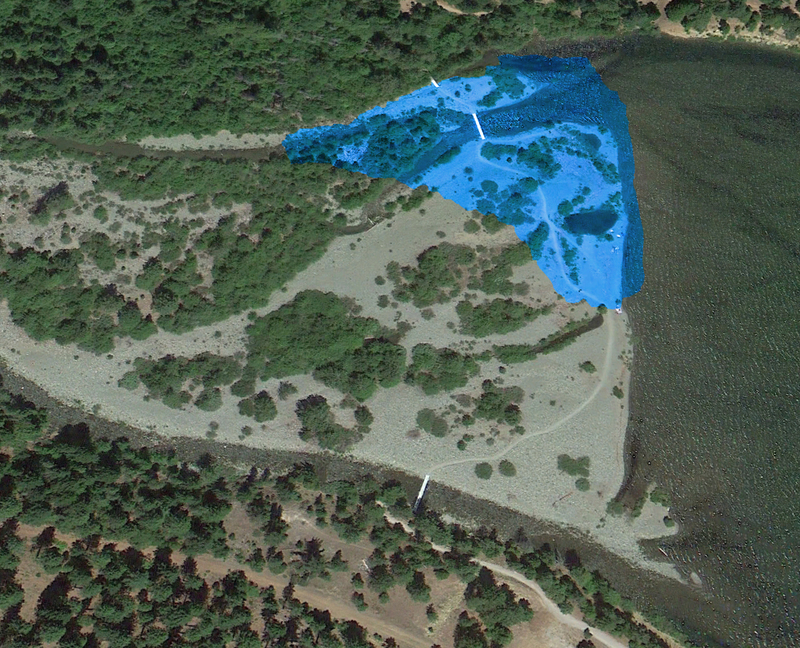 The diminutive Watkins Glacier is also recognizable from the east. For the few who venture into the remote eastern regions, this spectacular and unusual perspective of Mount Shasta is a magnificent reward. 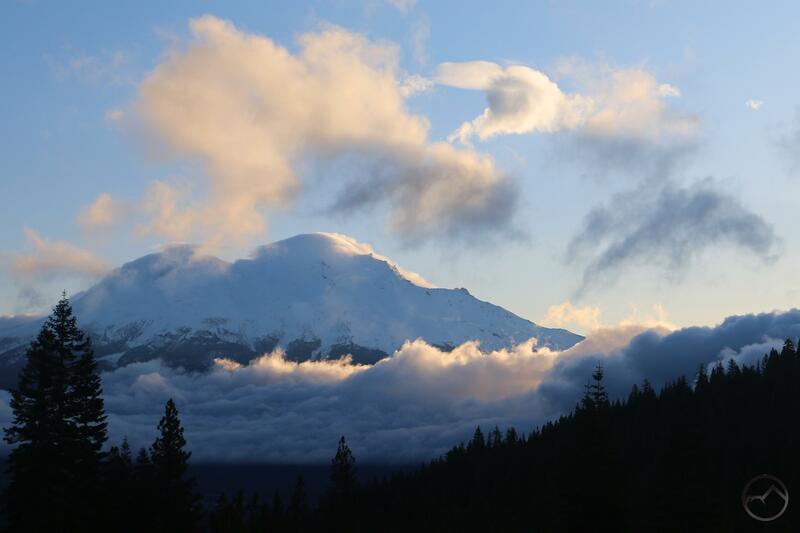 A variety of cloud formations cluster around Mount Shasta sunset. 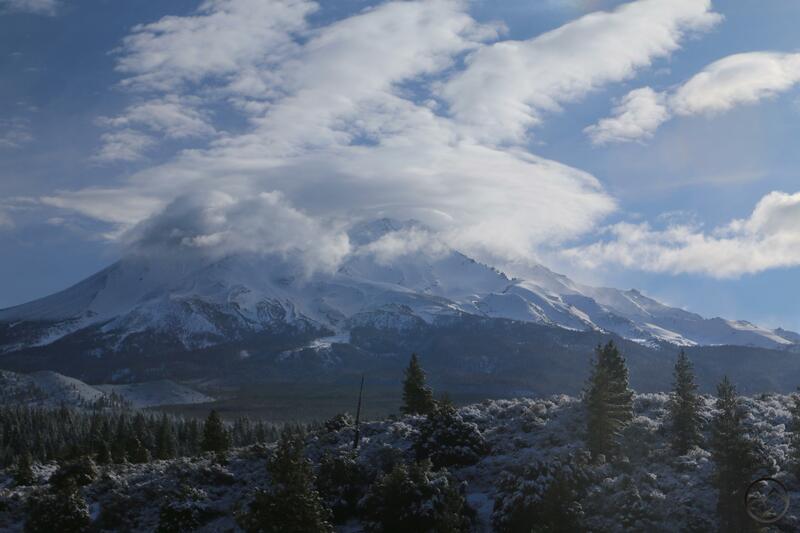 I got up much later than I normally do Thursday morning, only to find that there was a fine set of lenticular clouds in the sky on the north side of Mount Shasta. Of all the mornings to sleep later than normal, I had to miss the lenticular at sunrise. Not to be defeated, I headed to the southern side of the mountain, in the hopes of getting the clouds in the frame alongside Mount Shasta. The view from the south was as impressive as I anticipated it would be. I managed to capture a couple of interesting shots of the mountain with the cloud formations and then I headed back into town. Once there, I got one more shot to show a different perspective on the most distinct disk in the group. These clouds seemed rather stable so I planned to head out in the evening and try to get pictures of them at sunset. As I suspected, the lenticular cluster lasted through the day, but right as the sun began to set, the distinct shapes began to dissipate. One of the lenticulars seemed to have caught a wind current and stretched out across the sky as a rather dramatic spread. I had taken my three kids with me after dinner and they scrambled on the rocks at Castle Lake before I got into position for the sunset. As happens frequently, they played contentedly while I played with the camera. Of course, they practically ignore the magnificent sunset taking place right behind them, instead being quite focused on the rock obstacle course they set up for their cars. These kids really have no idea how fortunate they are. In the end, it was another stunning sunset. It may have lacked the great lenticulars that were present in the morning but the unusual clouds and great light made for a memorable evening nonetheless. Nevermind the sunset, there’s rocks to play with!